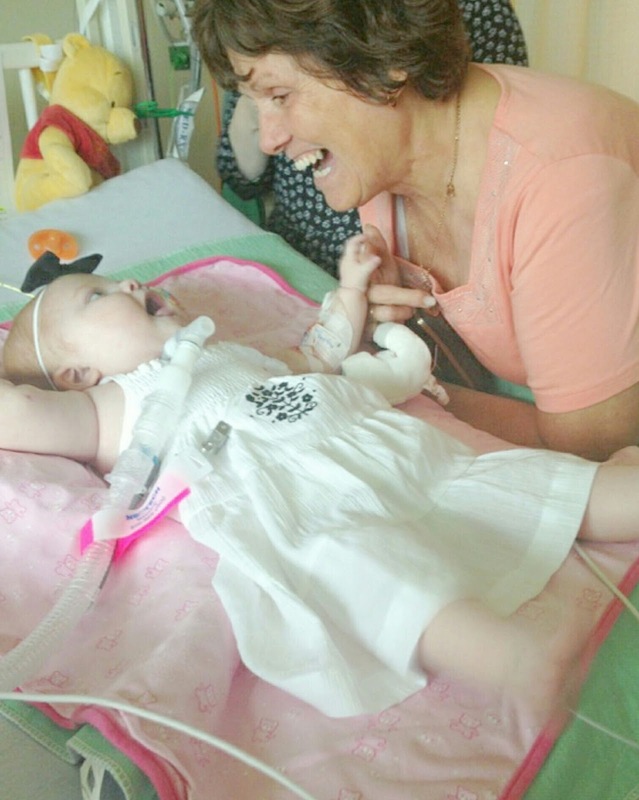 OUT OF PICU – FINALLY! WE ARE OFFICIALLY OUT OF THE ICU! I just can't believe I'm finally writing those words, so I'm going to say them again – after 323 days, we are finally out of the PICU! I remember thinking back in October, just after Evanna's first open heart surgery, that it would only be a matter of days, but days turned into weeks, and weeks turned into months (almost 11 months to be exact). It's why the beginning of this journey was so excruciatingly hard – we had prepared ourselves for the "normal" open heart surgery recovery time with maybe a bump or two, but not major setback after setback, and heartache after heartache. Slowly overtime this started to become our new normal, so setbacks weren't as devastating (well except Canada Day's episode) and we learned to just roll with it. While I'm still a social person this process has somewhat effected me – I eventually found myself not wanting to meet and talk to other families, and while I'm public about our journey, I became more private within the walls of the hospital. I couldn't relate to "heart families" anymore because within days and weeks of meeting them, they would soon transfer out of the ICU, go up to the floor and be discharged home while we yet remained. Don't get me wrong, I still have built relationships along the way, but I guess I kind of become somewhat "picky" – as its been a way to kind of protect myself. Originally we were going to transfer last Monday, but our primary intentivist asked if we would be okay to spend another week in the ICU just to be on the safe side, and we agreed that it was a great idea. We decided to restart Evanna on a tiny bit of Methadone last Tuesday and give her another week before trying again to wean her off again. On Wednesday we had a huge multidisciplinary meeting to discuss our impending transfer to Unit 2 – and including Nick and myself, there were about 12 people in that room. It was a really good meeting where we went over Evanna's history and our current problem list from head to toe. It was also confirmed that while transferring out of the ICU is a major step forward, we'll most likely hit our 1 yr mark in the hospital on October 6th, and unfortunately we're looking at a discharge closer to Christmas at this time . 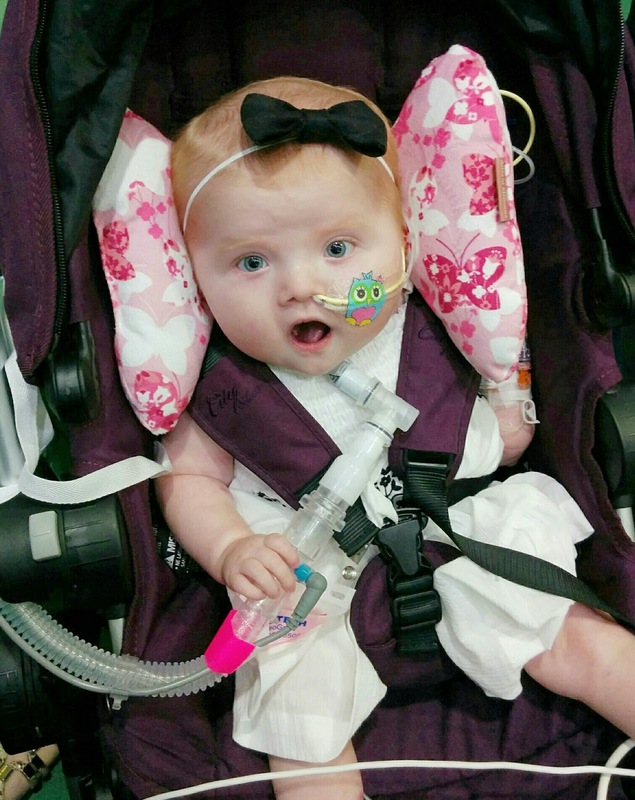 We were also heavily warned that with babies like Evanna and all her complex issues, that it's a huge possibility that we could bounce back to the PICU. The floors tolerance level for "misbehaving" is extremely low, and if there is suspicion that Evanna is starting to deteriorate in any way, a trip back to the ICU will happen immediately. It DID take us 4 transfers back to Calgary for one to finally stick (and we almost ended back up in Edmonton after her Septic Shock episode on Canada Day), so we have definitely come to terms that a transfer back to the ICU could definitely happen. Over the weekend Evanna's PICC line had to come out due to the fact that it was causing more problems then necessary, as well it had the potential to cause a lot more problems if we didn't remove it. Evanna is still on quite the antibiotic & antifungal treatment plan until September 3rd, so they put in another IV in her foot, and we're just praying that it holds on until then. If it does come out and they can't get another IV after 3 pokes, the medical team and Infectious Disease has come up with a plan to switch to oral antibiotics, but they would rather stick to the IV medications for their effectiveness. Evanna also got slightly fluid overloaded over the past week, and it reflected in her ventilation and how well her oxygen saturations were. She's been getting some extra fluid with all the antibiotics she's on as well as a saline infusion to keep the IV working, and she's not peeing enough to stay neutral. They decided to give some of her oral lasik doses IV and and even an extra dose last night, which seem to have helped. During rounds this morning they decided that while Evanna was on all these extra medications, to slightly increase her lasik dose and revisit weaning her off it when this treatment plan is complete. I originally bought this shirt back in September before Evanna's first open heart surgery as her "going home" outfit. Well, she's starting to get too big for it, so I thought now was a good of a time as any. So today – they rounded on Evanna early this morning with both the ICU team and the "purple team" from Unit 2, and after going over some las minute items we got the all clear for the transfer. The pediatrician (we won't be dealing with "intentivists" anymore – which going to be SO WEIRD!) said the room is all ready to go and probably a noon transfer will be best for both the PICU and Unit 2. Finally around 1pm we packed everything up and walked upstairs with the "STEP team" who will be following us for the next several days. Normally they only follow kids for about 24hrs, but given our prolonged PICU stay, they will triple that number. We were lead down the "Yellow/Vent" hallway that they have set up for kids like Evanna, and let us settle in. Within 30 minutes the pediatrician came and asked if we would join him for a meeting and left Evanna in the care of her nurse. 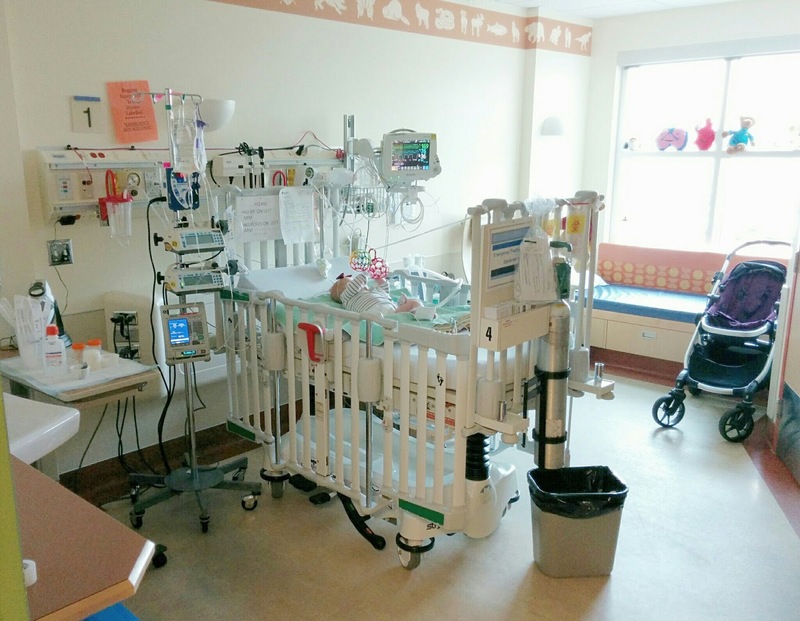 While we will no longer receive the one-to-one care we got in the PICU, we will still get two-to-one care compared to the three-to-one or even four-to-one care the rest of the unit has. The meeting was to just rehash out everything we already knew, but interestingly we learned what will REALLY get us home. While we have a few minor things that we need to work on, our biggest hurdle will be getting Evanna's "cuff" down. You see, Evanna's trach is a "cuffed trach", meaning there is a balloon filled with water that kind of acts like a seal. While I don't feel like getting into all the reasons of why they don't want Evanna going home with a cuff, I will say that I can definitely see why it's going to take a while for us to get discharged. She's on extremely high settings and the cuff ensures that it she's directly getting all of that support. The plan is to kind of work on a bunch of little things over the next month (and get her stronger), but maybe in about 4 weeks, make a mini trip back to the PICU, deflate the cuff and maybe upsize her trach to see if we can get her to a "regular trach". Overall, we're just going to take it one day at a time, especially this first week while we get settled into our new "home". Continued prayers while we make make this huge transition and thanks for keeping Evanna in your thoughts and following our journey. Why HELLO neglected blog! I’ve finally begun to take my laptop to the hospital to get caught up and STAY caught up. I wasn’t planning on bringing my computer to the hospital until Evanna got up to the floor (ie. out of the ICU), but it looks like I’m going to have to do it a week or two earlier than I anticipated. Anyways …. I truly hope the saying "slow and steady wins the race" is an accurate statement. While Evanna has made progress in a some areas, there have been other things that we've decided to hit the pause button on and put off until she's even more stable. In true Evanna fashion, a few weeks ago she continued to spike temperatures and have days were she was tachycardiac (high heart rate), so Infectious Disease and our medical team decided to keep Evanna on a good course of antibiotics and her antifungal for an extended amount of time – like until the beginning of September! We had a little scare on over the August lone weekend (what is it with Evanna and the holidays!?!) that put our intentivists and medical team into a state of Déjà vu from Canada Day, but with a timeout on the cooling blanket (to help bring down her temperature and heartrate), Evanna came around. 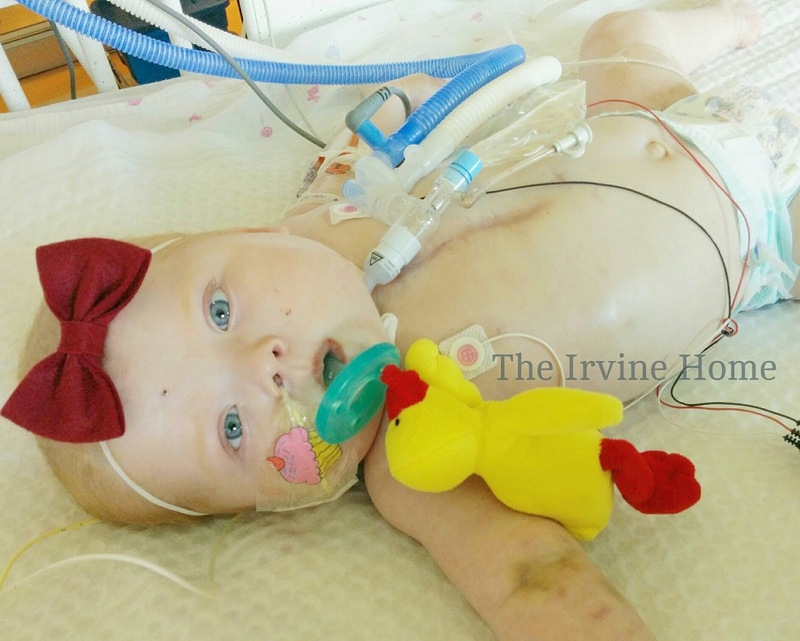 On Monday (July 27), Evanna had a quick little trip to the OR for a new PICC line. While it took them a little longer to place then we had anticipated, the procedure still went well and was an overall success. We also tried to restart NG feeds soon after, but due to "poop issues", we ended up going back to NJ feeding. While we know her stomach can handle food, when her bowels got backed up, it didn't want to absorb the food and she would just end up vomiting – so instead of administrating food into her stomach, they are being delivered into her intestines via an NJ. 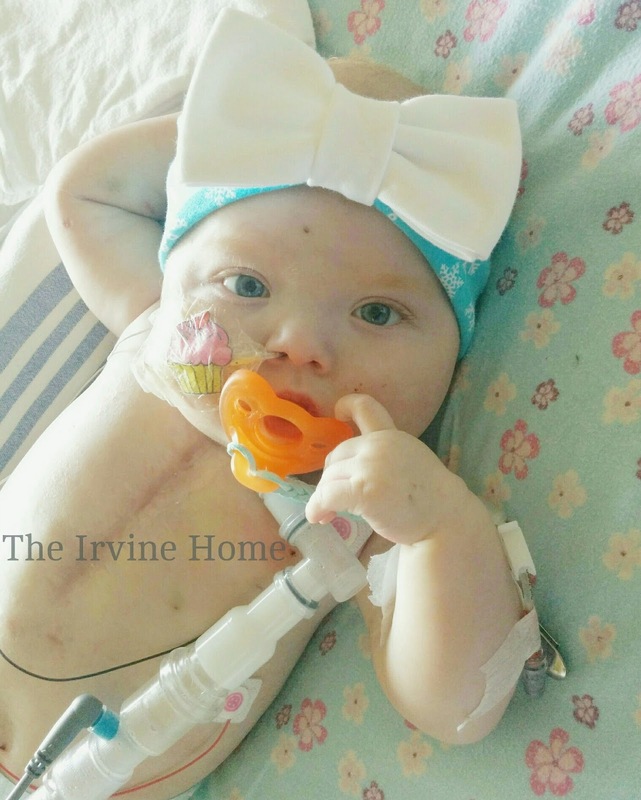 We talked with our primary intentivist Dr. Parsons, and together we all agreed that getting Evanna onto her home vent successfully needed to be the priority over her feeding. This means that while we are going to continue working on oral stimulation (mouth care, small chew toys, and her soother), we are just going to hold off on working towards bottle feeding for a few more weeks. We did agree to involve OT to start giving her mouth “tastes” of formula, but that’s about it. So with transitioning Evanna onto her home vent becoming our main priority, the RT team set out a schedule to do trials on the home vent and then give her breaks on the hospital ventilator. It started out with just one hour, then two hours, then 2 two hours, then 2 four hour trials, and then finally leave her on the home vent during the day. After displaying stability on her home vent during the day, they finally decided to put her on the home vent and leave her on for good. While Nick and I weren’t that surprised at how smoothly she transitioned over to her home vent (because she was on for an extended amount of time up in Edmonton before our transfer), the Calgary medical team was extremely happy and pleased with Evanna and how well it all went. During all of this we began to wean her Methadone (after successfully discontinuing her Ativan last month), and we went as slow as we could. Evanna got her last dose of Methadone on Friday (August 14), but she ended up getting a PRN dose of Methadone yesterday due to some nasty withdrawals. 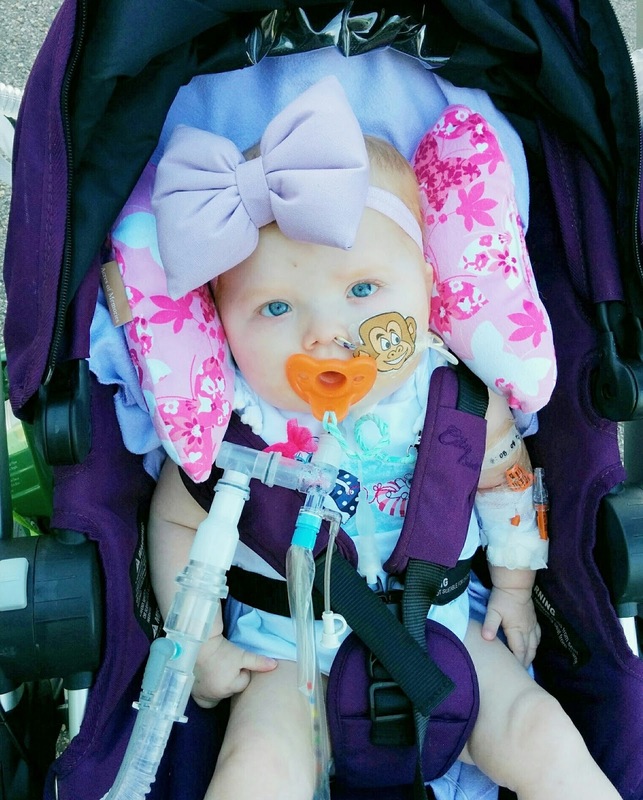 Probably one of our biggest milestones was taking Evanna for her first walk OUTSIDE and on her home ventilator on August 8th. When Evanna went for walks up in Edmonton, we stayed inside the hospital and she was still on the hospital ventilator (by the time she was on the home vent up in Edmonton, she caught rhinovirus and we were put on isolation, meaning walks around the hospital were no longer an option). Since then, whenever we have a good day we try our best to get Evanna out of the unit for a quick walk outside – even if it’s just for 20 minutes! The RT’s and nurses have stated they notice a positive change when we go for these walks – such has a happier demeanor and higher oxygen saturations. Speaking of Evanna’s demeanor – what a difference the last few weeks have been! After finally coming off of the Olanzapine (antipsychotic), and getting down to about 0.5mg of Methadone every 4 hours (she started at 1.0mg q4), we began to see our happy and smiley girl peak through. 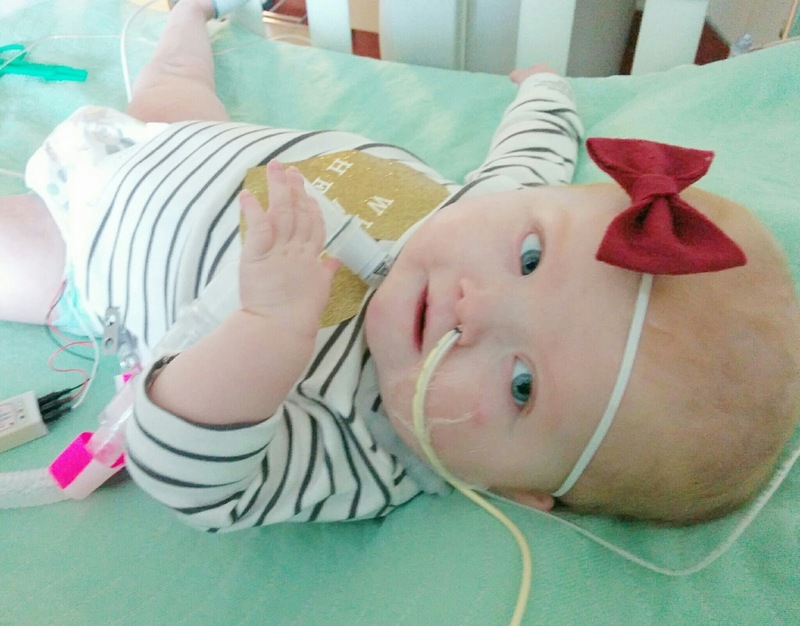 Every day that we came into the PICU, we would see more and more smiles from Evanna and it just brought us so much joy. Once we got down to extremely tiny doses over the past week, she would smile without us having to trying very hard, and she would also smile to every nurse, RT and doctor that walked into our room and they instantly became smitten by our little girl. Finally we’ve been working pretty hard with Occupational and Physical Therapy to improve her skills. A few weeks ago, Evanna could barely hold onto a light rattle, but she now grips it very well and shakes it with delight. We’re trying really hard to get her to sit up, and while it seems like she’s taking forever, I know with time she’ll be strong enough to do it. The last 10 months have caused Evanna to become extremely weak and lose a lot of muscle tone, but we’re very confident that with all the drugs coming off, Evanna is going to just fly! Much to Nick’s dismay (he doesn’t want a “TV Baby”), we are using movies to distract Evanna while she’s sitting up to help distract her from the fact that she’s doing hard work. 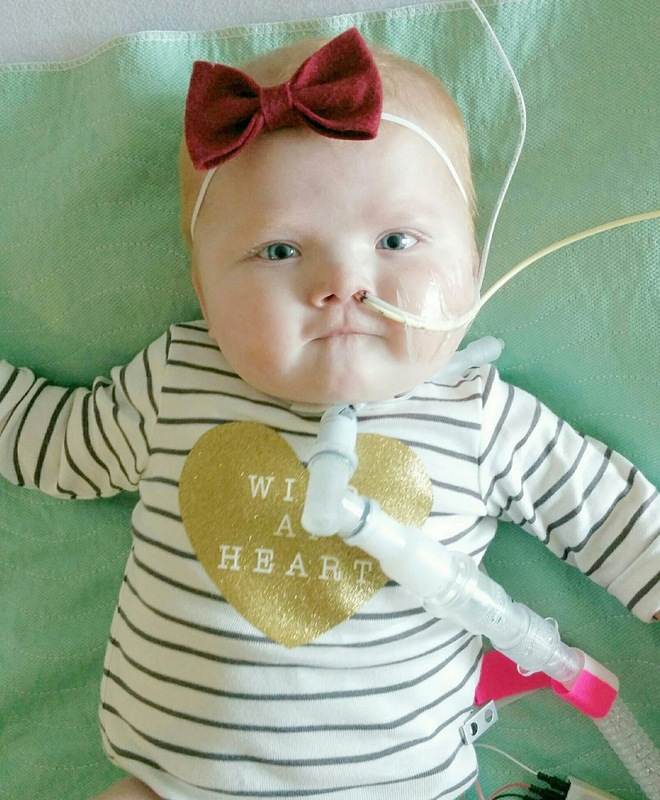 The trach and ventilator kind of complicate things (it’s an added weight and the tube gets in the way), but we’ve told that trach kids compensate and that we’ll be surprised at how well she’ll work around this obstacle and not let it stop her one bit. So what’s ahead? Well now that Evanna is on her home ventilator full time and has proven stability, talks are definitely turning to transferring out of the ICU and onto the floor. At this point I don’t want to publicly state our intended goal (I have a habit of jinxing things), but I will say that it’ll be soon! 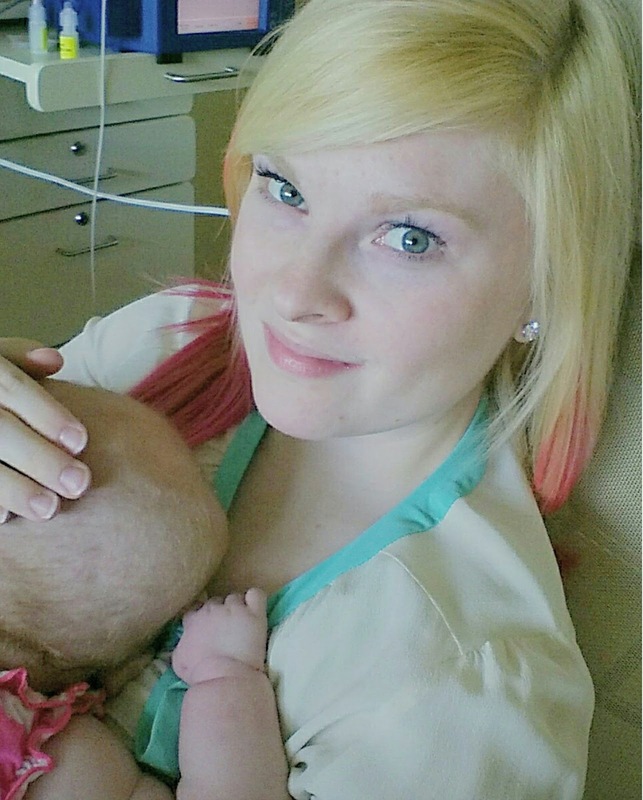 She’s kind of at a point of not being acute enough for the ICU, but too acute for a regular unit. 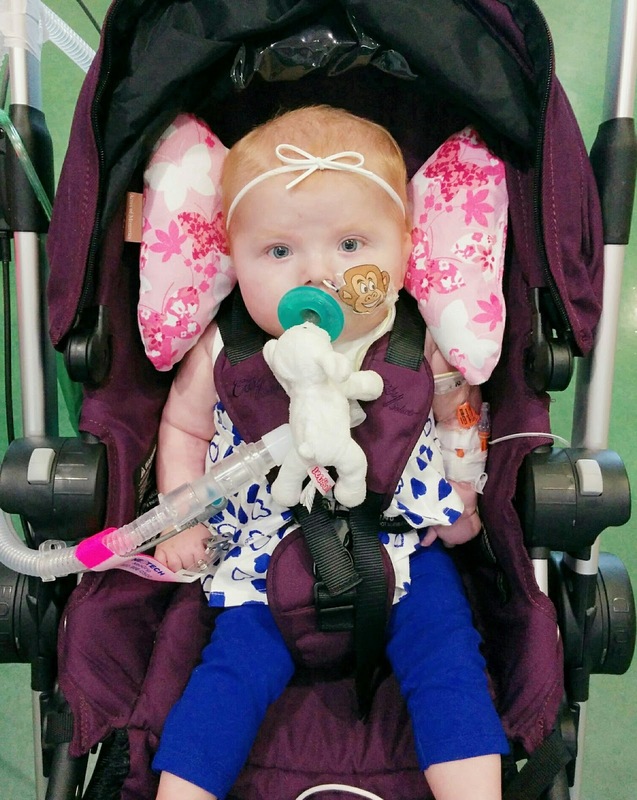 When Evanna goes up to the unit, she will be placed in a special hallway that’s for trach and vented kids, and she will receive two-to-one nursing care verse the regular three-to-one nursing care that the rest of the unit has. The RT’s from the ICU still come up and do their monitoring, but it will be less often, and overall more of Evanna’s care is placed on Nick and I (which we’re completely happy with, as it’s something we’ve often had to fight for here in the PICU). While they encourage Nick and I to go home at night and sleep in our own bed when Evanna is in the PICU, it’s somewhat expected that one of us stays with her during the night once she’s up on Unit 2 – so that’ll be an interesting adjustment. While the PICU is going to try their best to ensure a smooth transition, I’m fully expecting a few bumps as we get use to yet another new medical team. Hopefully they will listen and rely on Nick and me as they get to know Evanna and all of her quirks. We have also been heavily warned that while moving to Unit 2 will be a major step forward, to not be surprised if we end up back in the ICU once or twice on our journey towards home. 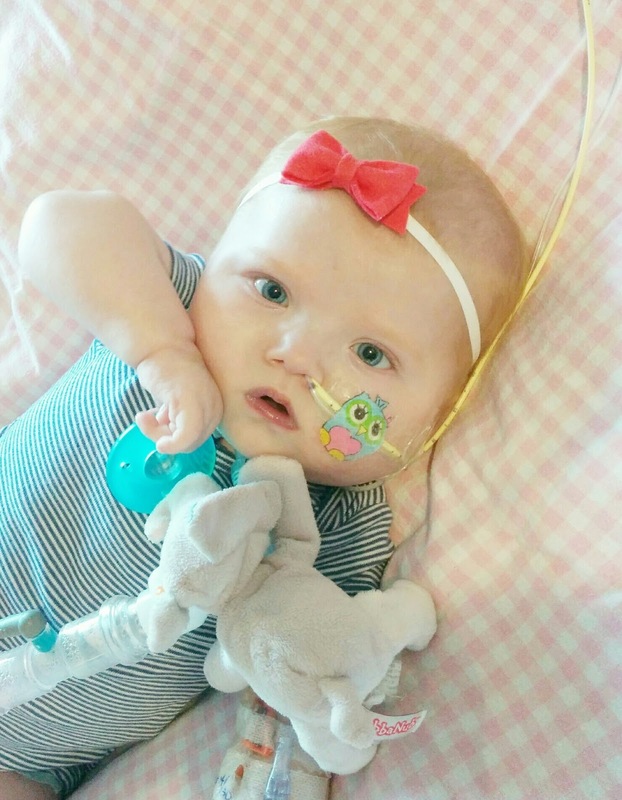 Evanna is extremely complex, and the floors tolerance for babies like Evanna (trach and vent) is extremely low, and if Evanna shows the smallest sign of not doing well, we’ll be sent right back to the PICU. While I definitely hope it doesn’t happen, it took us FOUR transfers back to Calgary for one to finally stick, so I’m fully expecting to bounce around the hospital a few times before that too finally sticks. Evanna has her own timeline, and we unfortunately have to follow her cues. Once Evanna is over these Methadone withdrawal episodes, we plan to start weaning her Chlonidine and restart NG feeds. Dr. Parsons has kind of put the NG feeding plan into our hands, and said to do whatever we want to do. We have been through many NG “transitions”, and have seen what has worked and what hasn’t, so he trusts us to know what’s best for Evanna with moving forward and has decided to give us some control. Lastly, Nick and I have begun to work on our “to-do” list of things we need to do in order to bring Evanna home. We’ve opted to do “self-managed care”, so there is a bit more work on our part up front, however we believe it will be the best option for our family. I applied for a business number last week (as we will technically now be employers), and we will be heading to the bank to open up a special bank account where AHS will allocate a certain amount of money to us (based on Evanna’s needs) to pay for nursing care. There are lots of checks and balances put in place (quarterly audits) to ensure the money is being used properly, and overall it’s going to be a huge adjustment. We will be heading to ikea next weekend to buy a few things for all of Evanna’s new accessories (a movable cart for her vent and suction machine, storage space for trach supplies and a comfy chair for the night nurses), and continue get our home ready for her homecoming. We have a few more things to get signed off on to be considered capable of caring for Evanna (though it’s been a tad annoying that because of our multiple transfers, we’ve had to prove some of the same things multiple times), and I’m hoping to do my CPR in the very near future. While we are much closer to discharge then we have ever been before, we still have many things to cross off our “to do” list, and I’m 98% sure we’ll hit the one year mark (October 6th) of being in the hospital. I’ve already come to terms with it, and instead of being sad about it, I’m trying to think of ways to celebrate and document this milestone. Thanks so much for continuing to follow along, cheer on Evanna and our family and keeping her in your prayers!